We recently started working with a miner in Thunder Bay, Canada and importing Thunder Bay Crystals including Auralite directly from him. The rough stock is mostly for sale from our Rough Rock Shop. But surely that’s not all we will do with this amazing rock? Of course not! More about our Thunder Bay adventures later but here is the first piece of jewellery I made with a piece of rough Canadian Chevron Amethyst from Thunderbay, also known as Auralite. 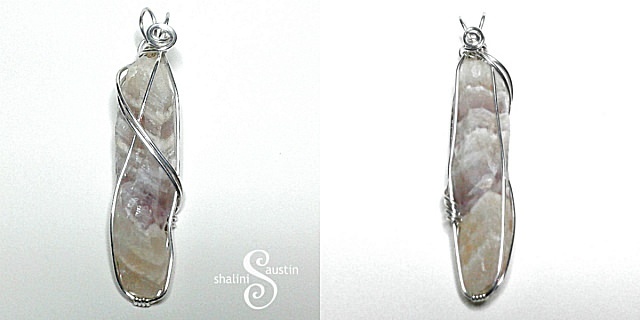 There is something very uplifting about wire-wrapping rough rock which has not been through the polishing process. Yesterday the supplier Alan and his lovely wife Monica were in the UK on way to a European holiday and Mr A met up with them in London to collect a new consignment. I thought it would be nice to gift my first piece of Auralite jewellery to Monica and wrapped a 2 inch piece in sterling silver for this simple pendant (she could wear it as a brooch on a kilt pin too) I am delighted to say she loved it!